Whenever my husband goes away hunting for a week, he usually comes back with a little gift for me. This year he brought me two large, red pine cone ornaments. He normally shops at one of our favorite rustic interior stores that is full of unique decor items. It took me about two minutes to decide that the first place I was going to use these pine cones was in my Thanksgiving centerpiece. We have our Thanksgiving dinner, every year, in our rustic game room since our group is too large to fit in our formal dining room. All we have to do is put our versatile ping pong table top on the top of our large pool table and it doubles as a dining table fit for a large group! However, the room is very rustic with a barn wood wall, birch chandelier, and animal trophies including a bear rug. In keeping with that theme, I wanted to create a centerpiece that was elegantly rustic. The table will still be filled with fine china, chargers and wine glasses! I had kind of a golden bronzy round tray to use as my base. All I did was place my two large pine cones into the tray and added small pinecones to fill in the gaps. To add a little more rustic elegance, I decided to make it into a pedestal. We have a wonderful piece of burl wood that makes an excellent base for a pedestal. For a little more color and glitz, I simply added some Fall picks that I had to the rim of the tray. Since the picks had a little sparkle to them, they added just the right touch of elegance to the display. To add just a little more to the table, I placed candlesticks at either end of the centerpiece. I used my crystal candle stick holders and gold taper candles. 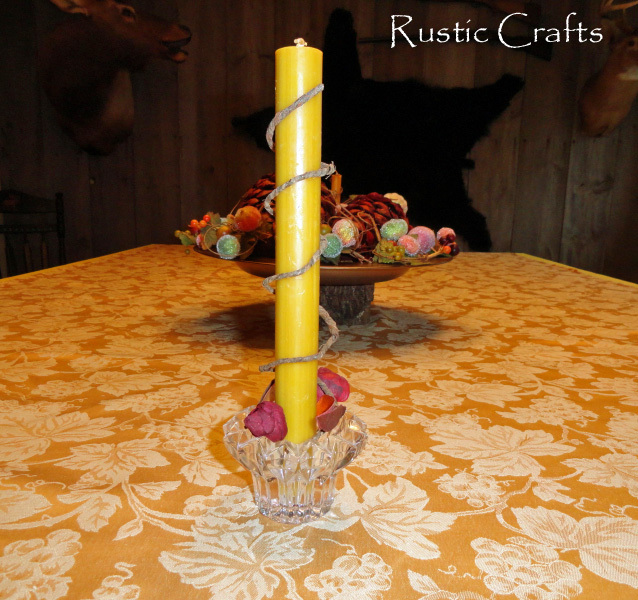 Then, to add a little rustic to them, I wrapped bark covered wire around the candles and placed some colorful potpourri in the candle holders. Now I just need to set my table and I will be ready for guests to arrive! 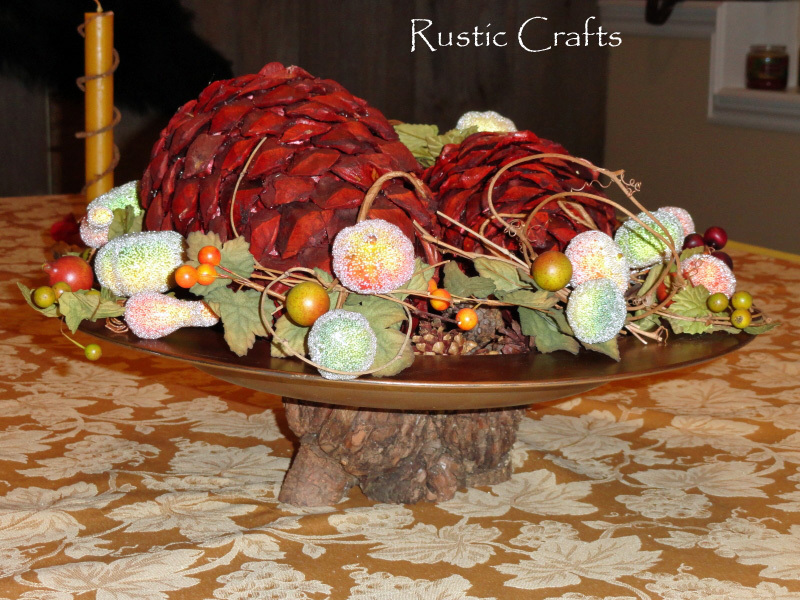 I hope this rustic centerpiece idea gives you a little inspiration for your own Thanksgiving table!